It seems a bit foolish to whip up a big bowful of chili when spring is here. And that’s the wonderful thing about Vancouver – buds and blossoms begin to show their colours in February and by March and into April it’s a thing of beauty. Saturday morning we hopped on our bikes and went out for breakfast and the weather was incredible – no jackets required. And when I went for a run later that night, with every breath I seemed to inhale every fragrant flower within my neighbourhood. Spring is here. And yet here I am posting about beans and yams – winter fare. When I went to the Asian grocer down the street yesterday, everyone was clamouring for the bags of pea shoots, yet I stood in line with an orange and some green onions. Oh well, spring will come into my cooking soon enough. It’s been a busy couple of weeks, work-wise, and I needed something comforting of the highest order. This chili set the bar. It’s sweet, spicy, smokey and hearty and utterly, perfectly, delicious. I used dried vaquero beans from Rancho Gordo that I had purchased last June when we swung by their retail shop while on holiday. Some people might panic at the thought of using dried beans when cans just seem so easy – I know, I used to be like that too. But it’s quite simple, really. That morning, I soaked the beans on the counter just after I made my morning coffee. They sat covered in water, swelling up slowly, for a few hours. Then, I drained and rinsed them and threw the beans in a pot with water and a couple of dried bay leaves and let them simmer for about an hour until tender. I used some of the cooking water to cook the yams and carrots – just use less broth if you choose to go this route. And there’s no need to fear any “ill affects” to using the bean water, if you know what I mean. 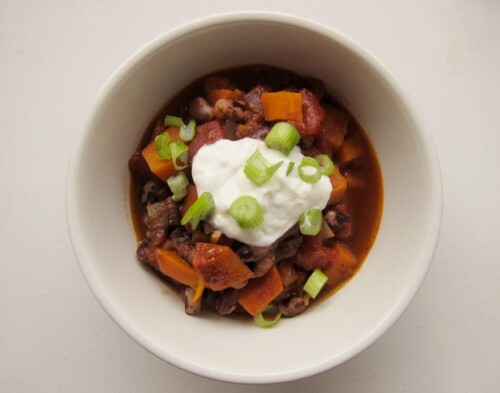 Despite the relatively simple ingredients, the flavour of this chili is a knock-out. The orange juice and zest provide a citrus punch that brings out such a complex bite. The orange flavour also helps to cut through the almost dusky, smokey flavour from the chili powder and chipotle. I loved it and urge you not to skip the orange! As for the addition of yams, sweet potatoes can be subbed in here instead if that’s what you’ve got. However, I loved the bright orange colour from the yams and carrots and even the ribbons of orange zest. It’s nice when you’ve got a chili that you can eat with your eyes as well. In a large sauce pan or pot, heat olive oil and saute the onions and garlic until wilted and just starting to turn golden. Add in the spices, along with the yam, carrot and stir until coated. Pour in enough broth to just cover the yams & carrots and let cook, covered for 10 minutes. Add in the tomatoes and beans and simmer uncovered over med-low heat until the liquids thicken, about 30 minutes. Add in the orange juice and zest and taste, adding salt and pepper. Let simmer for another 10 minutes before serving. Serve with sour cream and diced green onions. I’ve been using blood orange zest in recipes like there’s no tomorrow—so thanks for giving me an additional excuse to do so. 🙂 Also, it’s decidedly NOT spring here, so I’m still on the chili bandwagon! Thanks for this, Jeannette. I love chile pretty much all times of the year, except for maybe hot hot summer days! The orange is quite a creative addition, I’ll have to try some in my next batch. I think it’s colder here than it was pre-spring so a good comforting bowl of chili is definitely called for. Love that this is vegetarian and has some of my favorite orange veggies! Looks and sounds delicious! I’m sure this dish will come in useful for me many time before the heatwaves of TO arrive. 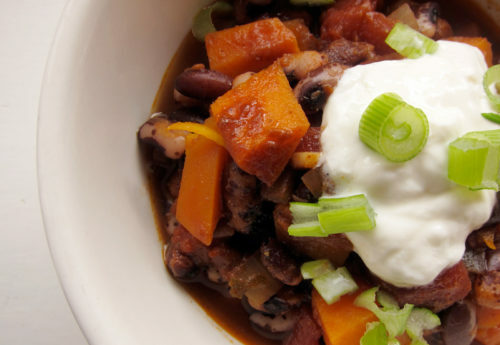 For instance, we are expecting wet snow on Friday so…perfect timing for a comforting bowl of chili! Anyway, this recipe looks wonderful. Thanks for sharing. Yum, this looks amazing! I love sweet potatoes/yams in chili! I just made this using heirloom organic tomatoes, my own stock, black beans and a blood orange; those last two contrasted nicely. The citrus makes this a spring-worthy chili. We’ll see what my wife thinks of it when she gets home from her spinning class. Starting from scratch with beans has the added benefit of zero sodium. By contrast, the can of black beans in my larder has 1500 mg of sodium (2/3 t salt). I used a pressure cooker to reduce bean cooking time from 1 hour to 5 minutes. Thanks Monika, the colours are great but the taste is outstanding! Yes, Eva! The weather turned chilly today so this bowl is definitely warming. Oh spring, where did you go? At least there is chili. Ash, me too, but sometimes convenience wins out. Maddie, use them up until they disappear from the markets! And if it makes you feel better, the spring went away today. Sigh. Jacqui, the orange works so nicely with the beans and the yams. It’s a great contrast. I loved this chili so much! Enjoy this Joanne, and take comfort that the weather here has turned too. Oh, what a bummer, Bijoux. It’s cooler here and rainy, but thankfully no snow. I’m sure you’ll love this chili! Thanks Rivki, enjoy the chili – it’s a good one, even if spring hasn’t arrived! Robert, sounds definitely spring-worthy. I’m sure your wife will love it. And good to see that a pressure cooker is a worthy investment! Beans in a snap! Wow, love it, especially cause it’s combined with sour cream! I have to tell you right off the bat….chili right now does NOT seem silly. Forecast for NYC tonight through the weekend: SNOW!!! This sounds perfect to whip up whilst hibernating in April. Meh. Love the sweet potatoes in here! I would not have thought of that but sounds so good. Makes me think of adding them into white chili as well? 🙂 Thanks for your nice response to my email as well!! It isn’t spring here yet. Today it is snowing and this looks like the perfect thing for dinner! Mandy, the sour cream takes it over the edge. Cory, so sorry to hear that there is snow in your future!! Yes, the sweet potatoes are unexpected, but work really well! That first photo is especially splendid. Chili is a wonderful dish just about all year long. Our favorite recipe has many vegetables but I find your recipe very appetizing because of the use of yams and orange juice. Have never added those two ingredients to the chili but will do so next time we cook it. Fruit juice is great in recipes, we add lime juice to a chicken corn chowder recipe and the result is fantastic. Without a doubt, your recommendation for yam and orange juice will make our next chili batch quite special. Thank you for sharing. Very nice photos, they illustrate the recipe so well. I agree with you on the dried beans front. I’ve been trying to incorporate them into my cooking. A nice jar of dried beans takes up a lot less space than those clunky cans, I figure. And the price difference! I meant to comment on this, like, a week ago, because I am totally enamored with the idea of yams and orange in chili. Yum! Indeed, Vicky, it’s perfect for do-ahead lunches! SixBalloons, I’m a new convert to dry beans. They are tastier and they don’t take that much longer to prepare. And they freeze well too once they’re cooked. It’s interesting to read through your comments on making this chili, it’s almost as though as soon as April comes around everyone feels that they should be cooking like Spring has arrived. Considering the unpredictable weather here in BC, I say cook whatever you feel like eating whenever you want(with seasonal food though, of course). I also see that you have some variations on chili which all sound interesting and delicious. I thought I would share my recent chili variation with you from a recent post on my own blog. I looove yams and beans in soup together. And what a great way to use your beans. I’ve been wanting to try those Rancho Gordo beans. I made this last night for dinner and it turned out amazing! Instead of yams I used sweet potatoes, I skipped the chipotle powder and used kidney beans (my favourite). As well, I served it with a loaf of french bread that I made garlic bread with. Yum! Can’t wait for leftovers tonight! 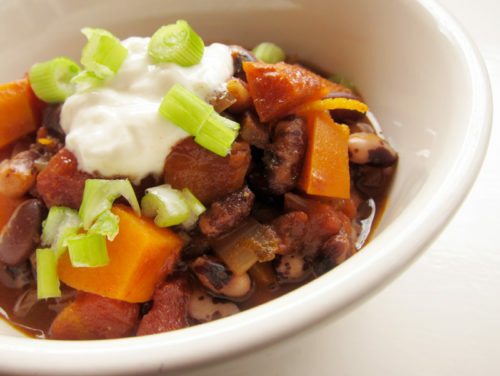 Made this last night with sweet potatoes and black beans (done in my pressure cooker). Thank you so much for sharing! It was absolutely delicious. You’re right about the orange flavour complementing it so wonderfully. Even my husband, who usually doesn’t like fruit in his savoury food, loved it and commented on how essential it was.